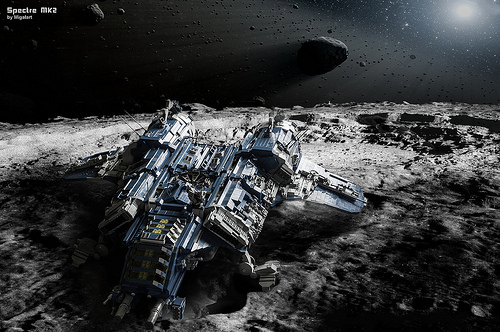 Michał Kaźmierczak has built a stunning spaceship — the Spectre. 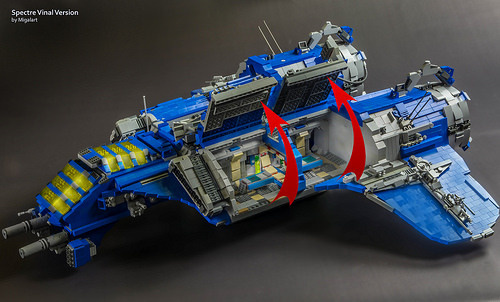 Whilst the model is decked out in Classic Space blue and gray, it’s anything but a retro throwback, making use of new parts and modern building techniques to deliver a creation so packed full of detail it’s a delight to zoom in on the photo and look around. Kudos for the opening hatches and the packed interior — excellent stuff. And if the model itself isn’t cool enough for you, Michał has used his photo-editing skills to fantastic effect on this hero-shot of the Spectre touching down on an asteroid. Cracking photography and editing show off the ship in all its glory. I’m getting a total Chris Foss vibe off this picture, and that’s about the highest praise I can offer on a creation like this. Beautiful.